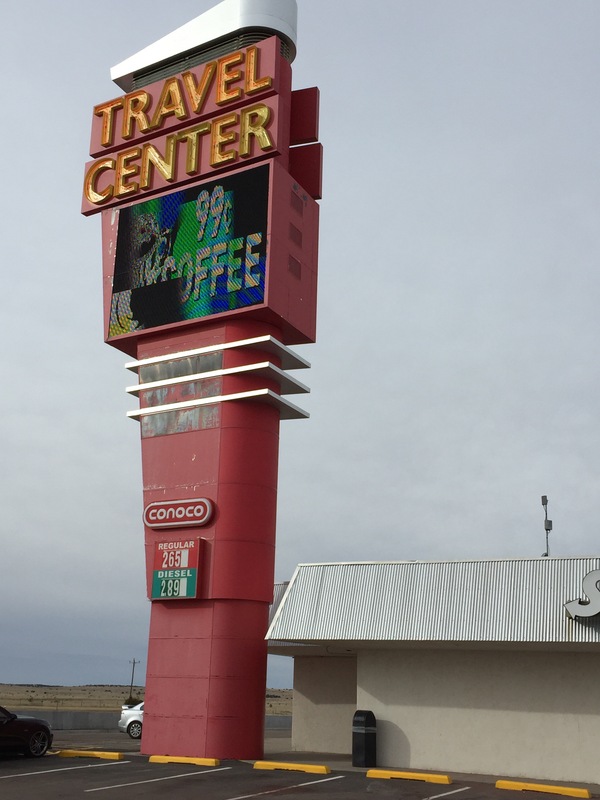 It’s 275 miles from Tucson, Arizona to Las Cruces, New Mexico, as the crow flies, and it’s just about the same distance if you’re traveling by car. 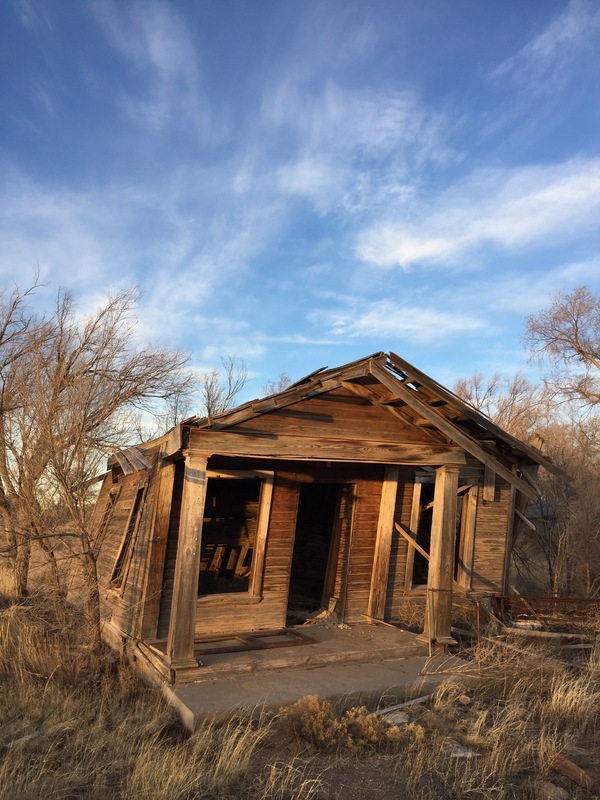 You get on I-10 and head east, and it’s a straight shot on an unbending road that takes you past long freight trains rattling west and dusty mountains framed by blue sky, bright sunshine, and high clouds. And speaking of dust, the section of I-10 from Tucson to Las Cruces is one of the few places in America where you’ll see highway signs warning you of what to do if you’re caught in a dust storm. As I took in the brittle, dry look of the surrounding landscape, with only a few desert plants here and there and lots of exposed earth, it wasn’t hard to imagine a dust storm kicking up. Fortunately, we didn’t encounter any dust storms — the recent snow presumably tamped down the dust, and it wasn’t that windy, anyway — but I now know from seeing multiple signs that you’re supposed to pull to the side immediately, turn off all lights, set your emergency brake, take your foot off the brake, stay in the vehicle with your seatbelt buckled, and wait until the storm passes. 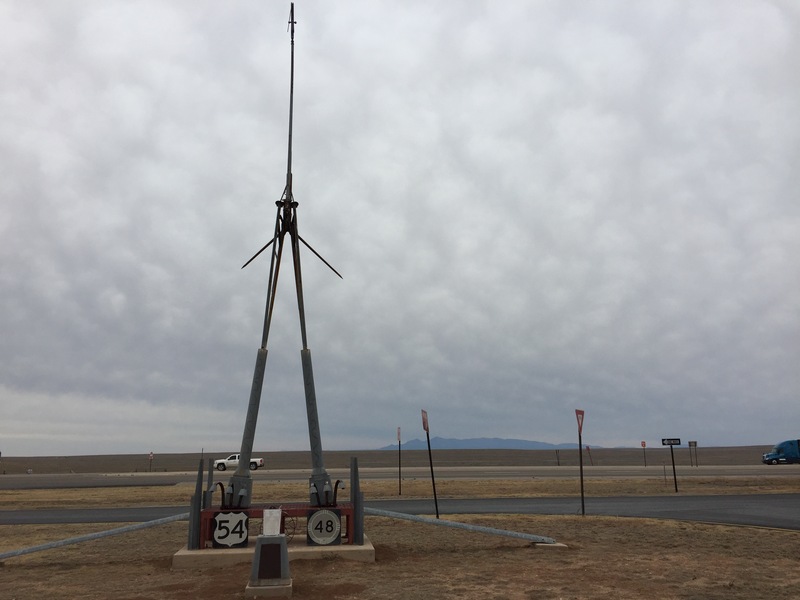 Shortly after you pass from Arizona to New Mexico you pass a notch in the southern border of the state that puts you within 40 miles or so of Mexico. If you look south from the roadway you see desolate countryside that probably hasn’t changed much in hundreds of years, more dusty looking mountains in the distance, and not much else. You do, however, have a great selection of Mexican AM radio stations to keep you company as you roll along. 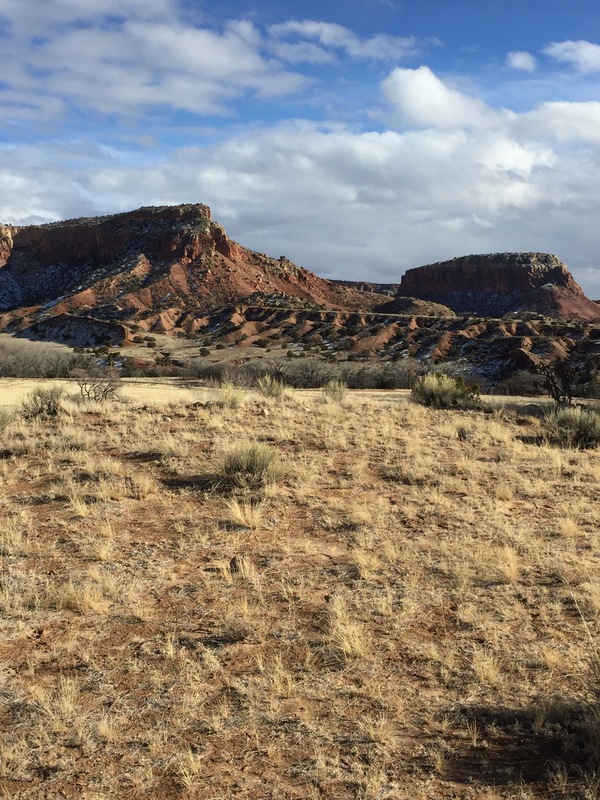 It’s not hard to see why Georgia O’Keeffe felt that the countryside around Ghost Ranch, in northern New Mexico, spoke to her. 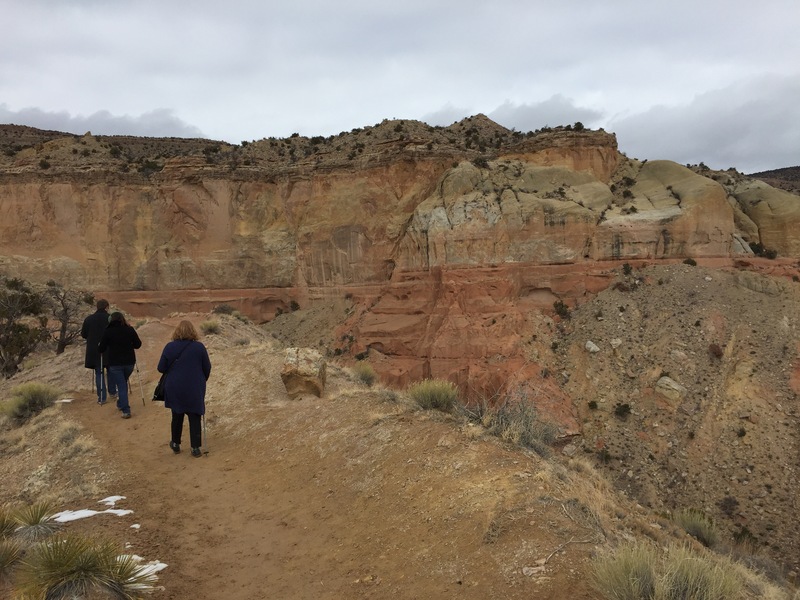 With its stark shapes, interesting geological formations, and colors that used just about every pigment In Mother Nature’s pallet, Ghost Ranch on a sunny day is a feast for the senses. 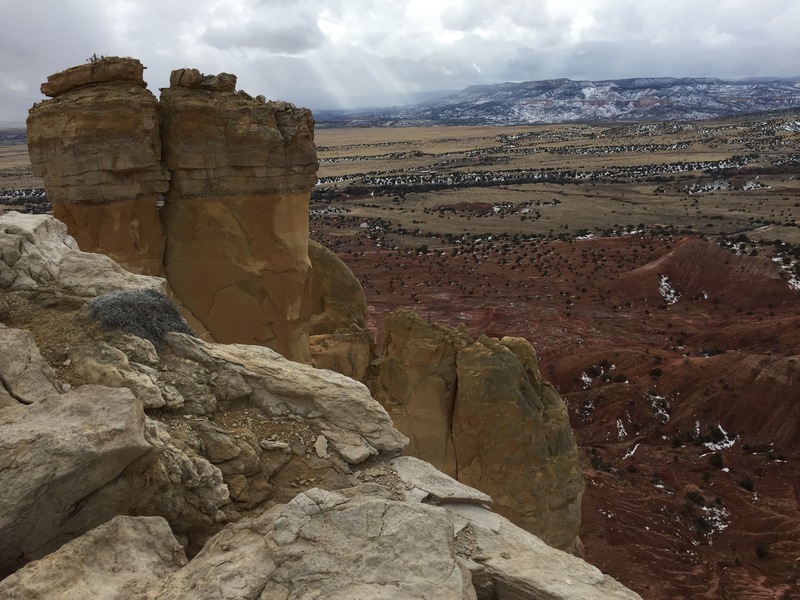 Yesterday we drove over to Ghost Ranch — Georgia O’Keeffe’s old stomping grounds — and hiked up to the top of Chimney Rock butte. 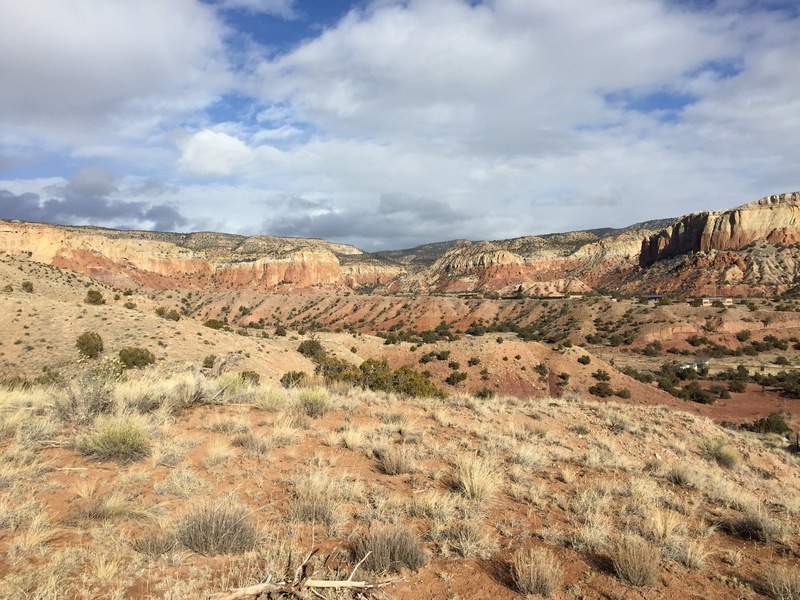 It’s about a three-mile hike, round trip, heading up and then scrambling down more than 600 feet. 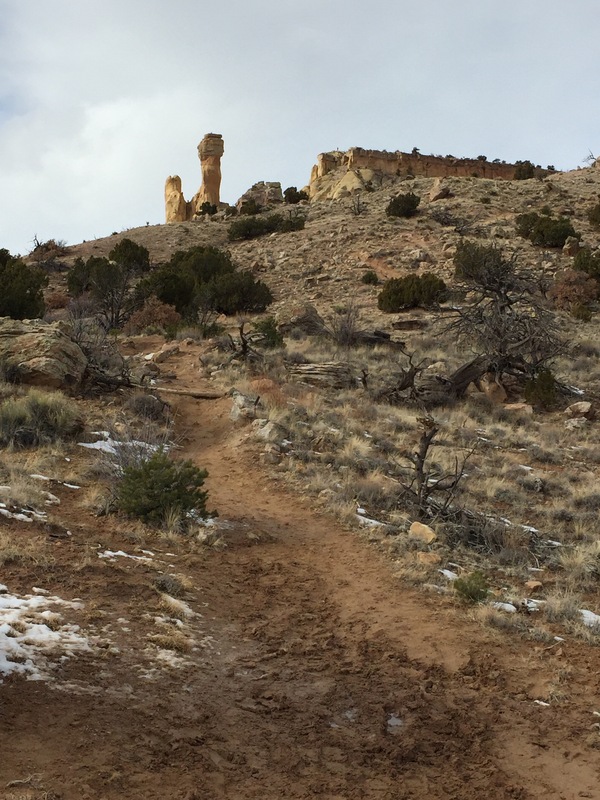 The trail is classified as easy to moderate, but it was complicated significantly by a lot of mud and some icy patches. Fortunately, the welcome center offers walking sticks, and we took them up on their offer. The walking sticks came in handy as we navigated the trail switchbacks and tried to avoid spills on the icy sections. The last section of the hike was especially steep and icy, but once we reached the top the view made the hard work all worthwhile. 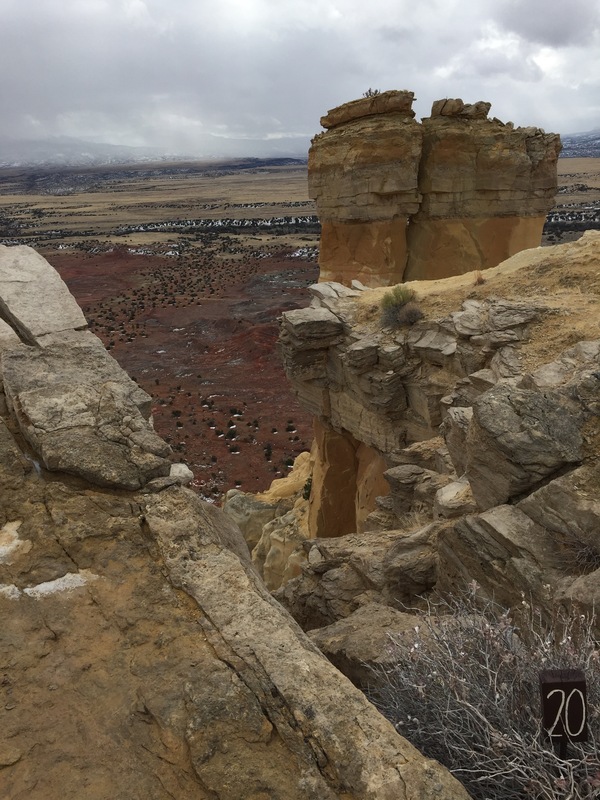 The butte is an outcropping that gives a commanding view of the surrounding countryside. We felt we could see for miles. The views on the way back down weren’t bad, either. The fine Georgia O’Keeffe museum in Santa Fe, New Mexico, teaches that beauty can be found just about anywhere — in skyscrapers, in flowers, in barns, in the rugged landscape of New Mexico . . . and in trees. 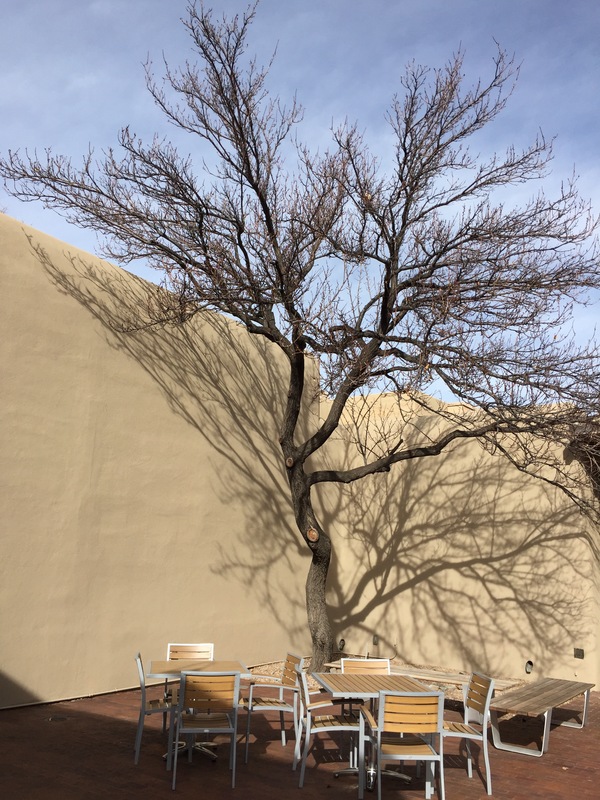 So when I left the museum and saw this tree framed against the adobe walls of the museum, with the sunshine etching an intricate shadow on the wall, I had to let my inner O’Keeffe snap this photo. How Much Would You Pay For Space? I’ve always wanted to go into space some day. When I was a kid and Apollo missions were landing on the Moon every few months, that seemed like a real possibility. Sci-fi features like 2001: A Space Odyssey forecast that routine commercial travel to the Moon would be available a decade ago. Of course, that didn’t happen . . . and now time seems to be running out. But perhaps there’s still a chance for 50-something space traveler wannabes like me. Virgin Galactic is nearing completion of the beautiful, futuristic spaceport shown at left, called the Virgin Galactic Gateway to Space, in the New Mexico desert. 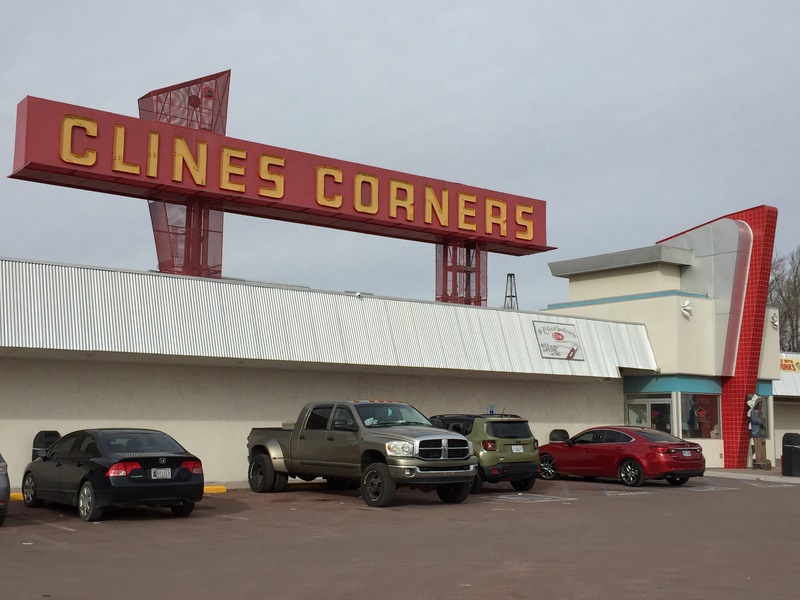 The company plans on beginning passenger service in 2014. 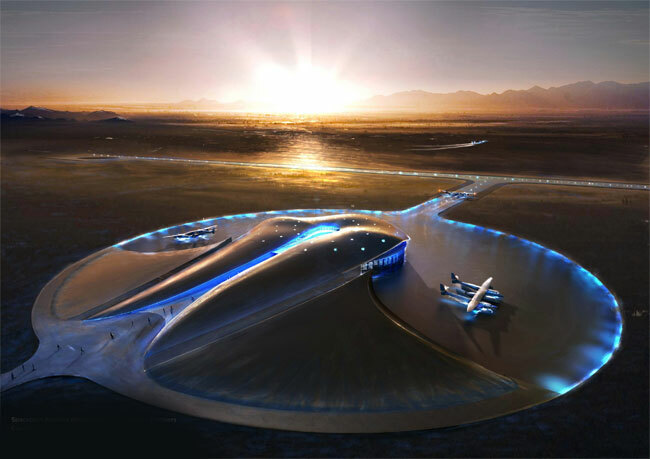 When the spaceport is operational, would-be astronauts will board a small rocket plane tethered to a mother ship. When the mother ship reaches a point nine miles above the earth, the rocket plane will be launched, the rocket will be ignited, the passengers will experience 3 gees of force as they zoom through the upper atmosphere until they encounter the blackness of space. The pilot then will cut the rocket engine and the passengers will experience four minutes of weightlessness and have a chance to enjoy a view so vast they can see the curvature of the Earth. Then the plane will reenter the atmosphere, hurtle back to Earth, and land on the spaceport’s long runway. All this will be available to the average Joe — provided the average Joe can pony up $200,000 for the experience. If I had millions of dollars in the bank, I’d do it. Because I don’t have that kind of coin, however, I’ll just bide my time and hope that competition brings the price of space down to more manageable levels so that, someday, a codger like me will be able to enjoy the wonders of space.